Hidden restaurant: An out of sight, not readily apparent or concealed business establishment selling local and seasonal meals or refreshments. During my travels around the Greater Boston and Worcester area, I found restaurants in unexpected and surprising locations. Each place I visited sources locally, and all are hidden in plain sight. Community and coffee come together inside a Cambridge brewery where flights of beer and flights of coffee are sipped side by side. I first visited Longfellows, a cafe inside Lamplighter Brewing Co. on a Sunday around noon. My husband and I enjoyed lattes before switching to a flight of beer and kombucha. Around us, a couple and their baby lounged on the couch, while others played a game of Sorry. Some chatted, some typed on laptops, but all intermingled, drinking beer and coffee and blurring the lines between coffee shop and brewery. Alisha Fowler’s dream was to open a community coffee shop, so when she and her husband and co-owner, Jesse Jenkins, learned their friends were looking for someone to open a café inside their brewery, “We got serious.” That was February 2016. Just a few months later, Longfellows, named for the local poet and the bridge connecting Cambridge with Boston, (and pluralized to emphasize community) opened inside Lamplighter Brewing Co.’s taproom. Longfellows sources its coffee beans from Barrington Roasters and tea from MEM Tea, plus milk from High Lawn Farm and honey from Boston Honey Co. “We’re really thrilled to partner with purveyors from across Massachusetts,” Alisha says. Even the breakfast sandwich features English muffins made locally by Stone & Skillet of Medford. On my second visit to the café, I tried Longfellows’ cold brew flight: cold brew, nitro cold brew, dry hopped cold brew and Jasmine Sparkler, a soda made from green tea. I munched on toast made with thick sourdough bread (from neighboring Bondir), topped with ricotta, tart-and-sweet cranberry jam (made with leftovers from the brewery’s cranberry sour) and pistachios. The café also sells Bondir’s croissants, mini donuts and holes from Union Square Donuts and sweets from Vinal Bakery. There are seasonal sodas made in house (like juniper-sage) and seasonal lattes (like clove, lavender, maple and honey-cinnamon). The café’s tagline is “Coffee and Community,” and its logo is a rising sun, meant to counter Boston’s long winters. “Our staff and vibe are genuinely friendly and welcoming,” and Alisha says, that’s what makes Longfellows different. If you go: The café is open 7:30am–3pm weekdays and 8:30am–3pm weekends. Street parking is limited unless you’re a local so be prepared to drive around the block a few times—or walk or ride your bike. Located between Central and Inman Squares. The market at Karl’s Sausage Kitchen is full of surprises. Aisles overflow with breads, crackers and crisps, spätzle, chocolates, mustards and jams from countries like Sweden, Norway and Germany. The deli brims with herring, caviar, tinned sardines and cheeses from Northern Europe, like Limburger, Leyden and Gouda. A butcher’s counter showcases housemade sausages like bratwurst and kielbasa. And tucked away behind this European market off I-95 in Peabody is a totally hidden authentic German café. I browsed the market and when my friend arrived, we found a table, ordered Gluhwein (mulled red wine) and hot hard cider and a bit of everything from the menu. We sampled imported cured meats and cheeses from Lithuania, Sweden and France. We feasted on poutine, pork schnitzel, German red cabbage and spätzle, with Bienenstich—a cream-filled pastry with honey-caramelized almonds—and Sachertorte for dessert. Anita Gokey and her husband, Bob, have run the 60-year-old business since 2007 but didn’t start the café until 2012. “The original design was for people to just get sandwiches,” Anita says, adding that their customers’ favorites are reubens, schnitzel, sauerbrauten and Hungarian goulash. If you go: The café is open daily for lunch and early dinner, for breakfast on weekends and until 8pm Th–Sa. Expect a 30–40 minute wait on Saturdays or order take out online. In an old red building, hidden beneath a Sturbridge antique store, is a brewery sourcing local grains for its beer and local food for its customers. I discovered Homefield Brewing (motto: “Big Flavors from Small Farms”) with a few friends on a cold afternoon in January. Down around back from the store’s upper entrance, we passed through a nondescript door into a room with a long wooden bar, exposed beams, roughhewn tables and local art on the stone walls. We chose a table and my friends sampled Homefield’s drafts (the cranberry-tart Candlelight and dark, smooth Manifest) and a couple of guests taps, including Wormtown’s Be Hoppy IPA, while I drank the Homefield Bucha, a raspberry-lemon kombucha. We ordered the Bold Board, a sampling of locally made sauerkraut and pickled peppers, and some garlic bread to start. We shared the Improv Jam, a grilled cheese made with Robinson Farm’s Arpeggio cheese on Rose 32’s bread with fig jam; the Shoveler, a roast beef sandwich made with grass-fed meat from Clover Springs Farm; and the chunky and flavorful beef stew, made with more local beef, carrots and potatoes. With a long background in farming, Jon and Suzanne plan to expand their own West Brookfield farm this spring in order to grow more raspberries for brewing, vegetables for canning and freezing, plus a new flock of hens and a few pigs for eggs and meat and to eat the spent brewery grains. If you go: Look for the red building with an antique store out front. 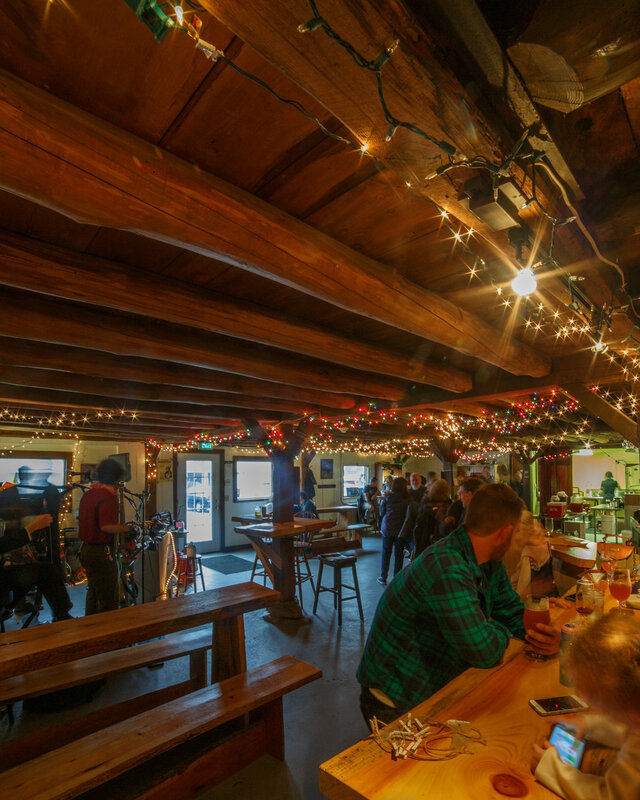 The brewery is open daily with live music on the weekends. Beyond the books and behind a curtain, I discovered and enjoyed an elegant afternoon tea at The Courtyard Restaurant hidden within the Boston Public Library. My friend and I opened the library’s big doors on Dartmouth Street into the grandeur of the McKim Building, walked through the marble lobby and entered the Map Room Café. There, in the far left corner, a curtain hides a room with vaulted ceilings and picture windows looking out onto the Italianate courtyard. Our hostess handed us each an old book as she took our coats and led us to our table with its white linen tablecloth, high-backed velvet chairs and purple goblets. Inside each of our books (mine, Rugby School’s Who’s Who) we found a menu for tea: black, green and white, herbal and oolong, all sourced by MEM Tea of Watertown. I chose the Rooibos Decorated while my friend picked the Spicy Turmeric Tonic. We ordered the seasonal cocktail as well, Lady Grey, made with Earl Grey tea and sparkling wine. Soon, we were presented with a three-tiered stand of savory sandwiches, scones and petit fours. Among these tiny bites were lemony shrimp salad with fine herbes on brioche, prosciutto with fig jam and ricotta, herbed chicken salad in a phyllo cup and smoked salmon with cured onions on pumpernickel. We slathered currant scones with clotted cream, blood orange preserves and lemon curd followed by chocolate sinclairs, lemon meringue tartlets, Earl Grey shortbread and macarons. We sat back, chatted and enjoyed this proper tea with a courtyard view. The Courtyard Restaurant opened for lunch and tea in May 2009 in what was once the library’s periodical room. Since June 2016, the restaurant has exclusively served an afternoon tea, operated by The Catered Affair, which updates its menu seasonally and sources locally through its wholesalers. If you go: The restaurant is open for afternoon tea Tue–Sa 11:30am–5pm, Sunday 1pm–5pm. Reservations are suggested. It’s not uncommon for a museum to provide food for their patrons—cafés or snack shops where one can grab a bite between exhibit halls—but rarely is a museum a food destination itself. A museum is a museum after all, filled with history, science, art and culture. But when I entered Boston’s Isabella Stewart Gardner Museum on a weekday last month, it was to have lunch first and explore the museum second. Café G, located in Renzo Piano’s 2012 “New Wing,” was bustling when my friend and I arrived at noon. But in less than five minutes we were at our table in this sleek, modern, glassed-in restaurant with red hanging lanterns and matching red chairs, a stark contrast to the museum’s 1903 Venetian-inspired palazzo. From the seasonal menu we chose roasted farm carrots with Cloumage and lemon honey to start. I ordered farro risotto with heirloom carrots, Brussels sprouts, ribbons of leeks and ricotta salata, while my friend chose a caramelized onion, Maine potato and Gruyere quiche. We drank local MEM tea and shared the apple cobbler, made with stewed apples, sesame seeds, sea salt, cinnamon and mascarpone. Chef Peter Crowley says the ongoing mission of Café G is to source local, organic ingredients as much as possible. Cultivating a relationship with both farmers and food producers, Peter works with Eva Sommaripa of Eva’s Garden, an herb farm in Dartmouth. He sources seafood from Rocky Neck Fish in Milton and gets his lamb from a farmer in Lincoln. Eva connects Peter to other farmers, and he frequents farmers markets to seek out unique ingredients. “We are small enough to be able to tweak the menu daily and incorporate what we want,” Peter says. Café G serves soda from Real City in Jamaica Plain and coffee from Fazenda Coffee Roasters in Dedham. Every April—since 1903—the museum hangs nasturtium vines from the courtyard’s second-floor window balconies, creating a striking orange display on the antique stucco walls. About eight years ago, Peter says, “we decided it would be cool to include nasturtiums in our dishes,” he says. “It’s been really popular. People see the nasturtiums cascading then go to the restaurant to eat.” Since then, Café G has served three nasturtium-inspired courses each April without repeating a dish, including nasturtium pesto, candied nasturtium, nasturtium cake and nasturtium meringue. This year’s menu will include nasturtium aïoli and nasturtium ice cream. When I tell Peter why I’m here, to highlight hidden restaurants, he tells me that so many people are surprised to learn there is a restaurant in the museum. “Nobody knows we’re here,” he says, and I agree. Café G is definitely hidden in plain sight. If you go: Café G is open 11am–4pm every day except Tu and until 8pm on Th. Entrance is through the museum’s main entrance but tickets are not required to dine at the restaurant. Reservations are possible but walk-ins are welcome.